Pierre-Charles Jombert (1748-1825), The Punishment of the Arrogant Niobe by Diana and Apollo (1772), oil on canvas, 40.6 x 32.8 cm, École nationale supérieure des Beaux-Arts, Paris. Wikimedia Commons. Following the story of Arachne, who was transformed into a spider because of her pride and refusal to acknowledge the superiority of Minerva and the gods, Ovid tells the deeply tragic story of Niobe, whom he tells us had known Arachne before she married. Niobe, daughter of Tantalus, a son of Jupiter, had married well, to Amphion the King of Thebes, that ill-fated city. When the women of Thebes are called to worship the goddess Latona (Greek: Leto), Niobe tells them that she is more worthy of their worship than Latona. Reeling off a succession of reasons such as wealth and family, she makes her children a part of her claim, as she has seven sons and seven daughters, against Latona’s two (who happen to be the gods Apollo and Diana) – Latona was ‘almost childless’ by comparison. Latona is outraged by Niobe’s arrogance, and tells her children Apollo and Diana to punish Niobe. Apollo finds Niobe’s seven sons practising athletics, and one by one, starting with the oldest, kills them with his arrows. Ovid names each in turn, and describes their falling quite graphically, with bits of lung being pulled from chest wounds, for example. News of this slaughter quickly reaches Niobe; Amphion, her husband, ends his grief by burying a dagger into his own chest. Niobe embraces the corpses of her dead sons, then taunts Latona again, still claiming her own triumph. me this one child! the youngest of them all! the life was taken from her only child. her lifeless daughters, and her husband’s corpse. her limbs and body, all were changed to stone. and to this day the marble drips with tears. The weeping Niobe is transformed into marble on a mountain peak, which drips water to form the River Achelous. Niobe’s children, the Niobids, have long been a popular subject for the sculptor, and in turn their sculptures have often been the inspiration for figurative drawings and paintings. Despite – or possibly because of – the grim carnage in this story, it has been a reasonably popular subject for paintings, and has attracted some very talented history painters. Here is my selection. 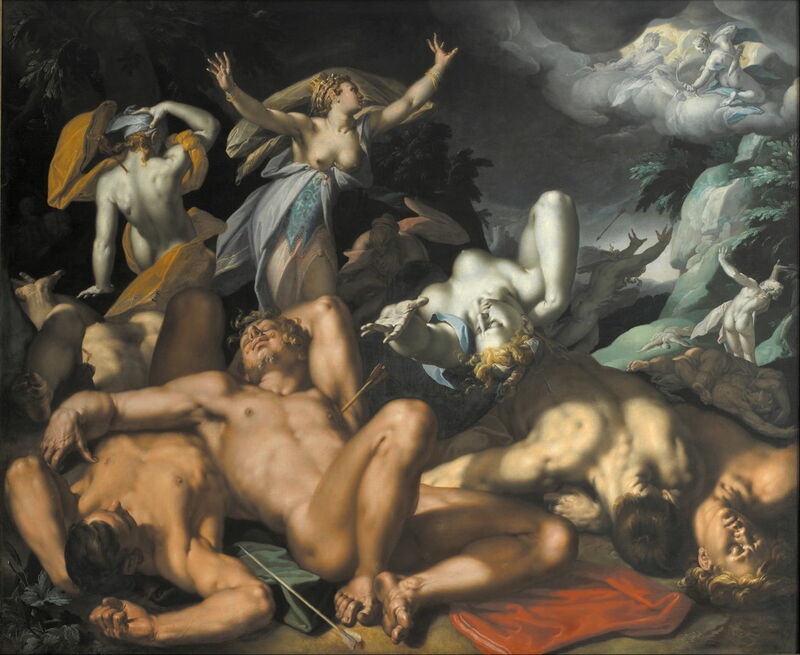 Abraham Bloemaert (1564–1651), Apollo and Diana Punishing Niobe by Killing her Children (1591), oil on canvas, 203 x 249.5 cm, Statens Museum for Kunst (Den Kongelige Malerisamling), Copenhagen, Denmark. Wikimedia Commons. Abraham Bloemaert’s Apollo and Diana Punishing Niobe by Killing her Children (1591) is a fine example of this story told very clearly. In the foreground, the corpses of most of the sons are laid out, with arrows impaling them. Just to the left of centre, wearing her crown with pride still, is Niobe herself. 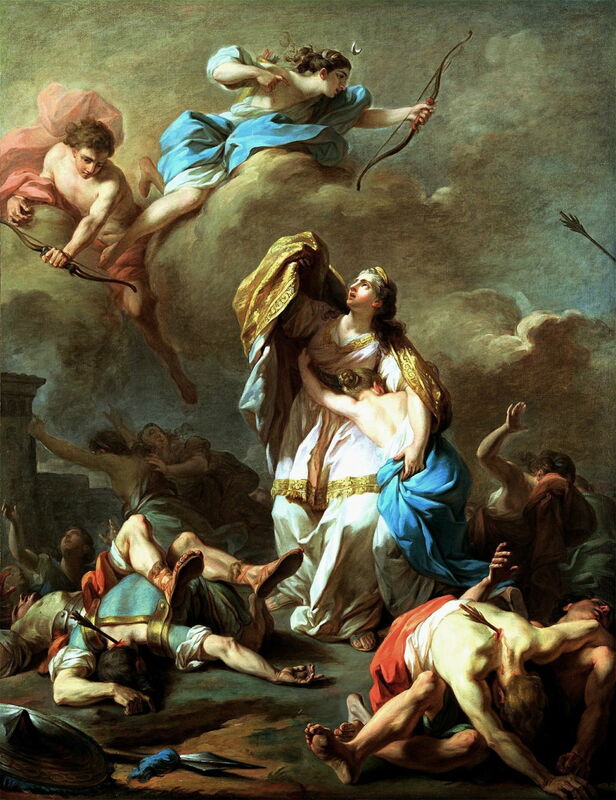 Around her are the marble-white bodies of her daughters, with Diana up in the clouds at the upper right, still loosing her arrows to complete the massacre. Richard Wilson (1714–1782), The Destruction of Niobe’s Children (1760), oil on canvas, 166.4 x 210.8 cm, Yale Center for British Art, New Haven, CT. Wikimedia Commons. Richard Wilson is much better-known as an early and innovative landscape painter, and the founding father of painting in Wales. 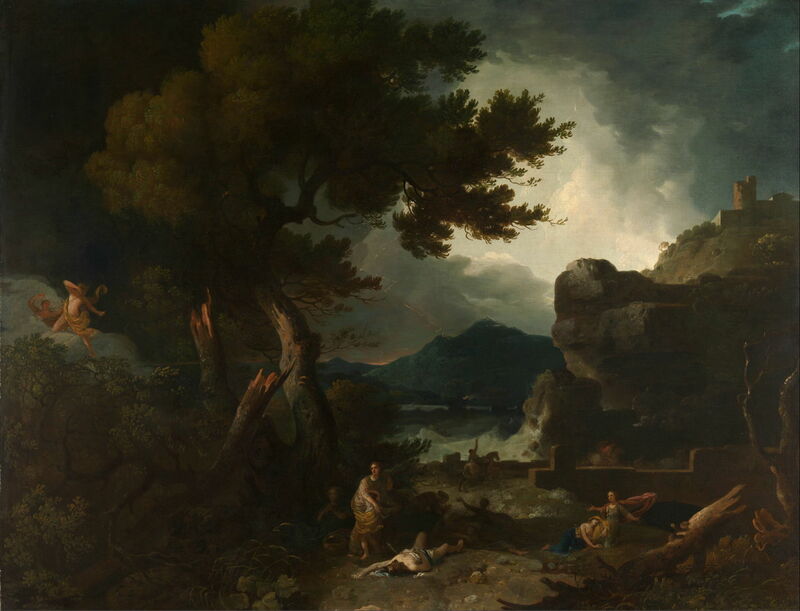 The Destruction of Niobe’s Children (1760) is a classical history-in-landscape, with a bolt of lightning in the centre far distance, a chiaroscuro sky, and rough sea below. He shows the story at an earlier point, when Apollo is still killing Niobe’s sons. The god is at the top of a steep bank on the left, with Niobe among her children down below. A dozen years later, and this story was the subject for the prestigious Prix de Rome (1772). 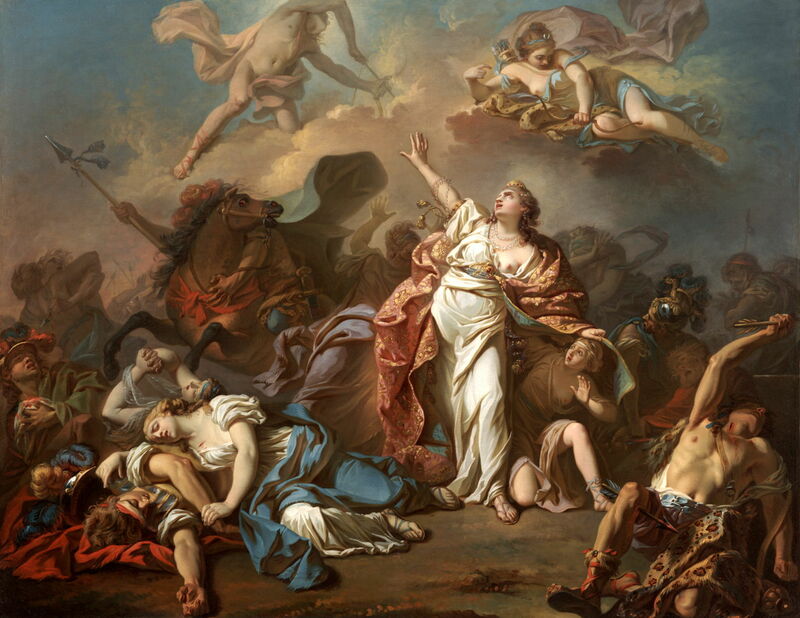 The winner was Pierre-Charles Jombert (1748-1825), with The Punishment of the Arrogant Niobe by Diana and Apollo (1772). He puts Niobe in the centre, as might be more typical of a religious story. She is trying to shelter one of her younger daughters from the raining arrows. Apollo and Diana are up in the clouds, Diana taking great care in her marksmanship. Around Niobe’s feet are the bodies of her sons, arrows protruding from them in witness to Apollo’s deadly skills. Jacques-Louis David (1748–1825), Apollo and Diana Attacking the Children of Niobe (1772), oil on canvas, 120.7 cm x 153.7 cm, Dallas Museum of Art, Dallas, TX. Wikimedia Commons. This was the second year that Jacques-Louis David (1748–1825) had entered the Prix de Rome, and he was so shocked that his Apollo and Diana Attacking the Children of Niobe (1772) was not the winner that he went on hunger strike for a couple of days. He was eventually persuaded to resume eating and painting, failed a third time the following year, but was finally successful in winning the prize in 1774. David’s canvas is a mass of dead bodies, sheltering daughters, horses, carnage, and death. Amid all this Niobe stands, her right hand held up to the gods, imploring them to spare her last remaining daughter. Apollo still seems busy with his bow, although Diana seems to have finished her task, which differs significantly from Ovid’s story. I must admit that I would probably have given Jombert the edge over David, and prefer Bloemaert’s close-in crop to the other three, in terms of narrative quality. Posted in General, Language, Life, Painting and tagged Bloemaert, David, Jombert, Metamorphoses, myth, narrative, Niobe, Ovid, painting, Prix de Rome, Wilson. Bookmark the permalink.